He swung the heaviest bat, earned the most money, and incurred the biggest fines. 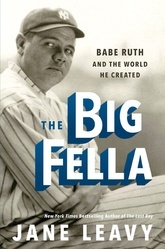 A larger-than-life figure on and off the diamond, he drafted the blueprint for modern athletic stardom. After hitting his 60th home run in September 1927, Babe Ruth embarked on the mother of all barnstorming tours, a three-week victory lap across America, accompanied by Yankee teammate Lou Gehrig. In The Big Fella, acclaimed biographer Jane Leavy recreates that 21-day circus and in so doing captures the romp and the pathos that defined Ruth’s life and times. Drawing from more than 250 interviews, a trove of previously untapped documents, and Ruth family records, Leavy breaks through the mythology that has obscured the legend and delivers the man.